The Airedoodle is bred by crossing an Airedale Terrier with a Poodle. 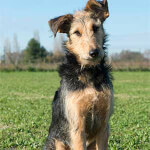 As a hybrid breed, the Airedoodle will inherit physical and behavioral traits of both the Airedale Terrier and Poodle. Airedoodles are known for being alert, friendly, bright, and loyal; however, not all Airedoodles will inherit the same characteristics (even if from the same litter). It is recommended that you familiarize yourself with both the Airedale Terrier and Poodle if you are planning to adopt an Airedoodle as each individual can exhibit more characteristics of one parent breed than the other. Below are the details and specs of the Airedoodle dog breed. The Airedoodle is a medium to large sized dog breed. Generally the size of the dog is dependent upon the size of the poodle used in breeding. An adult Airedoodle should weigh in between 50-70 pounds and will generally reach a height of 22-26 inches. Airedoodles do best with children and pets if introduced to them at a younger age. Adult Airedoodles may be apprehensive towards people and other animals if they are not familiar with them. Airedoodles who are socialized with children and pets as a puppy make fantastic household companions, and they respond exceptionally well to training. You can expect the Airedoodle to be a medium maintenance dog breed. Their coat will need to be brushed at least three times per week and may need to be clipped regularly. Their Airedale terrier roots make these dogs very energetic. They need daily exercise in the form of a long walk, and they are happiest when there is a large yard in which to frolic. 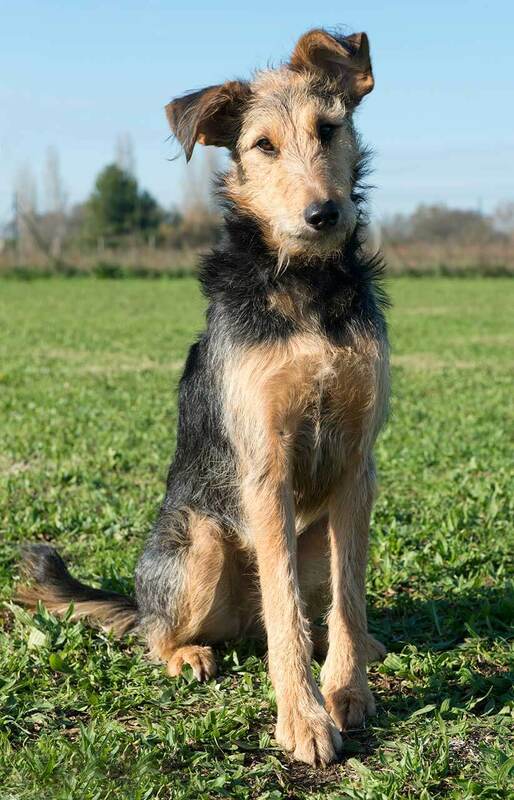 The breeds that make up the Airedoodle have centuries of history, but the Airedale itself is a new dog breed and because of this the breed does not have a very detailed history. The Airedoodle has seen tremendous gains in popularity in the last few decades as designer breeds have become highly desired. As a crossbreed, the Airedoodle will inherit physical traits from both parent breeds. Not all Airedoodles will inherit the same traits which means some Airedoodles may have more Poodle characteristics, others may have more Airedale Terrier characteristics, and some may exhibit a mix of both parent breeds. It is likely, however, that the majority of Airedoodles will have traits common in both the Airedale Terrier and the Poodle. Airedoodles are athletic and muscular dogs. They should have strong legs and a tail that is thick at the base and gradually gets thinner towards the end. Airedoodles hold their tails in the straight or slightly raised position and raise it further upwards when excited. Due to its hybrid background, this breed comes in a variety of colors, most commonly in shades of tan, gray, silver, black, and brown. Airedoodles are medium to large size dogs, largely dependant upon the size of the Poodle used in the breeding process. Most Airedoodle breeder's will likely use standard size Poodles which would make the Airedoodle a medium sized dog weighing between 50-70 pounds and reaching up to 26 inches in height. Due to its size, the Airedoodle is suitable as a guard dog, but will require ample exercise in order to stay healthy. The temperament of the Airedoodle is dependent on the behavioral traits inherited from its parents. Some Airedoodles will inherit a majority of traits from the Airedale Terrier, others the Poodle, and some will have a roughly equal mix of both parent breeds. As such, you should expect the Airedoodle to have behavioral characteristics common in both the Poodle and Airedale Terrier. Airedoodles are known for being very intelligent and easily trainable in both obedience and tricks. These dogs want to please their owners and appreciate a firm owner who praises good behavior. Airedoodles are extremely personable and loyal dogs with great character, making them great as companions or guard dogs. Airedoodles are affectionate dogs that do well with children and in a family setting. Airedoodles will do best with children if they are socialized with kids when they are a puppy. Airedoodles can get along with other pets without issues. Good behavior is mostly likely if the Airedoodle is introduced to other animals at a young age. Since both the Poodle and the Airedale Terrier have hunting instincts, they may see small animals such as birds, rabbits, etc. as prey and want to chase them. The Airedoodle may display protective behavior when confronting strangers, however, they shouldn't be aggressive unless they perceive the stranger as a threat. In most cases, an Airedoodle will bark to alert their owners of an unfamiliar person. Below are pictures of the Airedoodle dog breed. The Airedoodle is a low to medium maintenance dog breed. They need daily exercise to burn their ample energy, and their coats require regular brushing in order to stay shiny and healthy. The Airedoodle has a thick coat that is short to medium length with a wave or curl to it. This coat of this breed requires regular care in order to keep it shiny and robust. Airedales should be brushed at least twice per week to keep the coat free of debris and to loosen excess hair. Most are light to average shedders, however, the Poodle is a non-shedding breed so some Airedoodles may shed very little or not at all. The Airedoodle is an energetic breed and should be exercised daily to prevent their excess energy from being used to fuel unwanted habits. A 1-2 mile walk each day and a large yard to run around in will keep an Airedale healthy in mind and body. The Airedoodle can adapt to a wide variety of environments. However, due to the Airedale's high energy, apartments are not ideal. Airedales will feel most at home with a yard and ample space to run and play. Airedoodles can tolerate a wide range of temperatures and are therefore suitable for most climates. However, if it is below freezing they should be provided with a warm shelter and if it is very hot they should have access to water and shade in order to stay comfortable. The Airedoodle is considered a healthy breed and is not particularly prone to any ailments. Still, these dogs can experience tooth infection and ear infection on occasion. Regularly cleaning can help prevent these issues from arising.